By layering, you have more flexibility with conditions and body heat. Join our facebook group and help us spread the word. It’s starting to get cold out there. Fortunately, our everywear base layers and fleeces are here to keep you warm when you’re out there. Our short sleeve wicking tops have been designed to be lightweight performance tops, but they also work well as a base layer under one of our long sleeve Base tops. Jun’s been testing this out doing winter training for athletics in Battersea Park at night – he assures us it was absolutely freezing last week and he even considered taking a layer off. In between sets he was curled up in his local warming fleece. One reason it’s good to wear wicking tops in the cold (and layers of wicking tops particularly) – when you stop moving, there’s less moisture against your skin to give you that post-exercise chill. Yew Clothing is proud (really proud) to have joined 1% For the Planet. This means that Yew is committed to donating at least 1% of its sales to environmental charities. The organisation is made up of businesses that realise that industry and the environment are inherently connected. For us, the environment is the reason we make clothes (getting out there – and not being naked) but also motivates the way we do it (choosing only sustainable fabrics). We’re really pleased to be part of 1%FTP. We’re introducing a couple of new products on our online store. The first is the Winter Sports Health Pack that we launched with natural healthcare website, Trust William at the Ski & Snowboard Show in London last month. It has Manuka Honey, Glucosamine tablets, Echinechea Fizz and Glucosamine gel in the pack – all good stuff to keep your joints and health going through the winter. We’re also about to start stocking Green Oil, an eco chain lube for your bike. We’ve been using Green Oil for years and recently met the founder – so we decided to stock it on our site. The oil really does work well and is free from petrochemicals and is biodegradeable. It’s also been well reviewed by Pro Cycling, 220 Triathlon and Mountain Biking UK (amongst others). 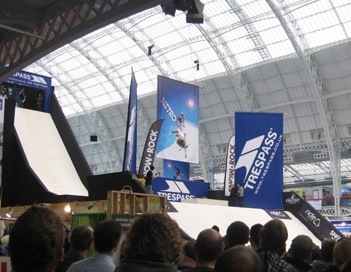 We had a fantastic – if exhausting – time at the Metro Ski & Snowboard Show. It was great to show off our products and meet so many people. A big thank you to everyone who came by our stand. We were also really pleased to have our prototype sustainable snowboard on show (handmade by our friends, Disaster Industries). We hope to have more news about that soon. Take a look at some of the pictures from the show in our online gallery. If you want to get in touch, email us at info@yewclothing.com You’re receiving this newsletter because you told us you wanted to stay in touch. Not interested anymore? Unsubscribe.